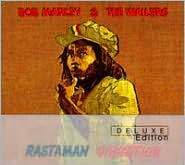 Bob Marley had reached critical mass as an international star when he came to make Rastaman Vibration in the winter of 1975-1976, having scored a Top 40 hit in the U.K. with "No Woman, No Cry" and seen his and the Wailers' last three studio albums belatedly enter the U.S. charts. Marley was acutely aware of his increasing status and its value. "We bubbling on the Top 100, just like a mighty dread," he sang in "Roots, Rock, Reggae," which indeed became his first American chart single when it was pulled from the album, while Rastaman Vibration itself spent four weeks in the Top Ten of the Billboard charts, the highest-charting LP of his career. Marley used his soapbox to emphasize his religious/political concerns in socially conscious songs like "Johnny Was," "Want More," and the musicalization of one of Haile Selassie's speeches, "War." The result was one of his most substantive collections. This vastly expanded reissue adds more than an hour and a half to the original 34-minute album, providing a musical view of the entire period in Marley's music. "Jah Live," the single that preceded the album, and "Smile Jamaica," which followed it, are included, along with six previously unreleased alternate mixes of songs from the album and a ten-song concert performed at the Roxy nightclub in Los Angeles on May 26, 1976, during the tour supporting the album, which had been released a month earlier.